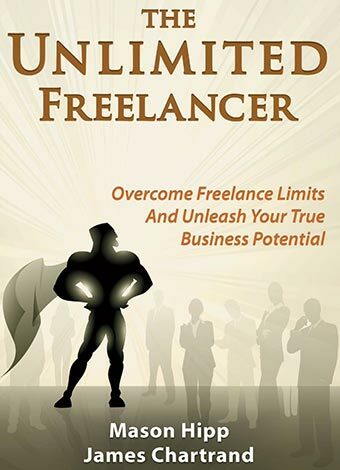 We are excited to be able to bring to you a new book: The Unlimited Freelancer. Join us as authors Mason Hipp and James Chartrand tell us how to take our Freelance business to the next level. Unleash Your True Freelance Potential. Have you ever wondered why the majority of freelancers are struggling day-after-day, while a select few are succeeding beyond their wildest dreams? Why do some freelancers need to work 60+ hours a week just to pay the bills, when others are easily expanding into profitable businesses or vacationing around the world with a stable income? If you think about it, most freelancers have what it takes to be that successful—strong will, independence, intelligence, creativity, skill. Why, then, do so few of us ever really make it? Because freelancing is rigged, that's why. It's incredibly difficult to be that successful on your own, with the weight of an entire business on your shoulders. There are so many challenges that come with freelancing that it often feels impossible to get through the day, let alone accomplish your dreams. Freelancing doesn't have to be a daily struggle. You too can build the business of your dreams — the business that you wanted to have in the first place. Sure, it takes hard work, but you're probably already used to that anyway. By using the proven strategies in this book you'll be running a successful business in less time than you thought possible. The ideas we'll show you in The Unlimited Freelancer can even help you expand from a successful freelance business into a larger, multi-person company (if that's your goal). These are tactics that have been used by companies around the globe to increase productivity, earnings, and growth. In this ebook, we’ll teach you exactly how to implement them — and exactly how to take the next steps in growing your business. What Strategies Are In The Book? There are three main strategies that we discuss in The Unlimited Freelancer. Each of these methods can significantly improve your freelance lifestyle on their own — but when used together, these strategies work so well that you could easily see your business improving in a matter of days. Let's take a look at the specifics. We'll show you how you can create systems for all areas of your freelance business that will allow you to save time and effort without sacrificing quality. The right systems, software, and automation can be instrumental in growing your business and allowing you to make more money — without letting it take over your life. Freelancing is often thought of as a solitary activity — but if you look at successful freelancers you'll see that nothing could be further from the truth. Highly successful freelancers, entrepreneurs, and business owners will all tell you the same thing: success requires help from a lot of people. In this ebook we'll show you how you can start working with other people to help improve and grow your business. We'll cover things like outsourcing, partnering, and hiring other freelancers -- and we'll explain how to avoid the common problems and create working relationships that can make you millions. Most freelancers make money by creating things for clients in return for a one-time payment. What if I told you that you could do the same amount of work, but make significantly more income over a long period of time? That's what happens when you turn your skills inward to create assets that make YOU money, not someone else. Writers can sell books, designers can sell themes, programmers can sell code — what matters is that you're creating something one time and making money repeatedly. In The Unlimited Freelancer we'll show you exactly what you need to do, and even give you a few ideas to get started. How Is This Different From Other Freelancing Books? When we started this ebook, there were already several excellent books on "How to Start Freelancing" — so we didn't try to cover the same topics. Instead, this book focuses on how to take your freelancing career and launch it into an incredibly successful business. This content may be a little advanced for new freelancers, but it is still tremendously valuable for just about anyone.